The USS Bluefin (SS-850) was a Gato-class submarine. Her keel was laid down on 27 August 1942 by the Electric Ship Company of Hartford, Connecticut. The Bluefin was launched on 23 May 1942 and commissioned on 28 September 1942. The USS Bluefin was placed on Atlantic Patrol and was assigned to Submarine Squadron 55 (SubRon 55). On 15 October 1942, she was sent on her first war patrol under the command of Captain James Deerborn in support of Operation Flame. Her first war patrol lasted from 28 November to 27 December 1942 off the Spanish coast in the Bay of Biscay. From 19 May 1943 to 14 August 1943 the USS Bluefin would go on seven more war patrols before having to return to the United States to take on her final mission. 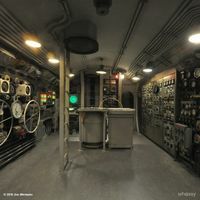 Interior of the USS Bluefin set; posted by Jim Michaels. 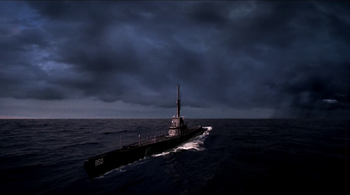 A Men of Letters in the OSS would pull some strings and requisition an active U.S. submarine to transport Delphine Seydoux and the Hand of God to the United States, the USS Bluefin was chosen for this mission. The Bluefin would come under attack by a German warship, lead by Befehlsleiter Gumprecht, who was searching for Delphine and the Hand of God. It was believed that the sub was sunk by the Germans on 25 November 1943, its contents never to be recovered. In reality, a time travelling Dean Winchester is sent back to retrieve the Hand of God. But, as the Nazi's are close to sinking the ship, Delphine used the Hand of God to stop Gumprecht, completely destroying the USS Bluefin, leaving no trace of it behind as well as sinking the German destroyer and incinerating the crew. This page was last edited on 20 March 2019, at 09:13.